In the past fifty years, the experience of the Chinese economy has continually challenged the assumptions of laissez-faire economics. It has sustained a strong growth rate, changed the structure of international economic relationships and has become critical to many multinational corporations. Now, it appears to be on the verge of becoming a new economic superpower. 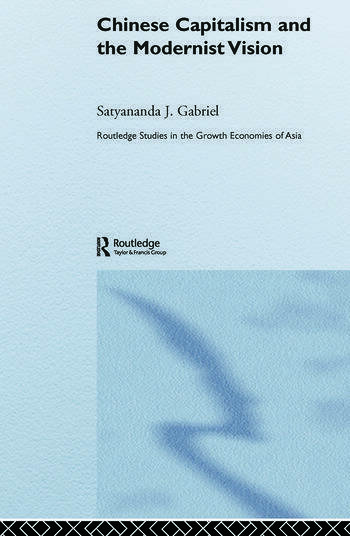 Addressing the structure and dynamics of the Chinese economy, Satyananda J. Gabriel examines in-depth the connection between growth and the particular version of Marxism that has been adopted by the Communist Party of China. One of the most comprehensive analyses of the contemporary Chinese economy, this book covers industry and agriculture, rural and urban enterprises, labour power and financial markets, and the process of integrating the Chinese domestic economy into global capitalism. Chinese Capitalism and the Modernist Vision identifies the current transition in China as a historic passage from state feudalism to state capitalism that will significantly alter both the internal political and economic dynamics of China and the global political economy. Satyananda J. Gabriel is associate professor of economics at Mount Holyoke College, USA and academic coordinator of the Rural Development Leadership Network.